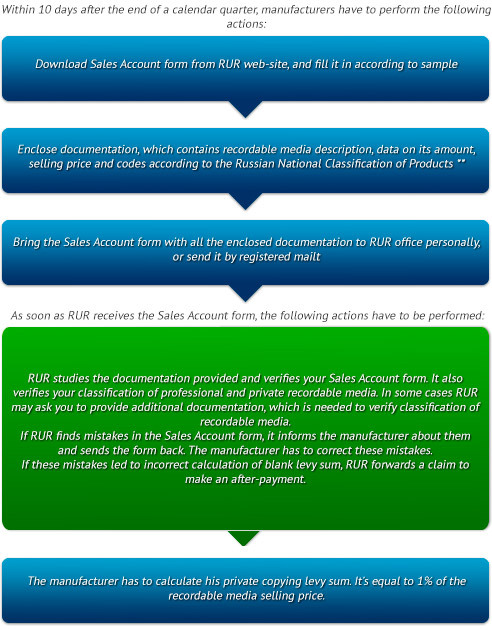 If you are a manufacturer of recordable media, used for private copying, Russian legislation obliges you to pay blank tape levy, which will be distributed to authors, performers, phonogram and AVW producers. Decree of the Russian Government «On remuneration for free reproduction of phonograms and audiovisual works for private use » of October 14, 2010, # 829. Exporters of recordable media and producers of professional equipment, which is not to be used privately, do not pay blank tape levy. 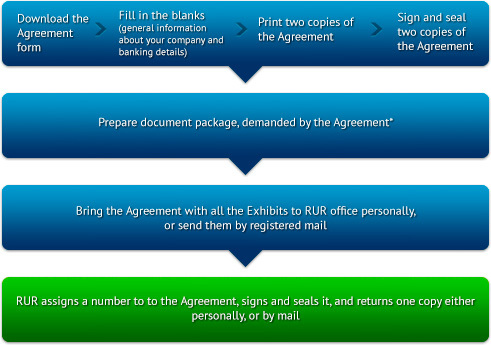 RUR is a collective management organization, accredited by the Government for collection of private copying levy on behalf of authors, performers, phonogram and AVW producers. What is to be done by manufacturers? documents (such as work manuals, operation instructions, technical documentation etc.) which prove that listed recordable media is professional and cannot be used for private copying.